The next annual meeting of the Mariological Society of America (MSA) will be held May 15-18, 2018 at the Bergamo Center in Dayton, Ohio. The theme of this year's conference will be: The Blessed Virgin Mary's Relationship to the Sacraments of Healing and Christian Vocation. The Call for Papers will last until October 15, 2017. This tiny little booklet (available in paperback, e-book, or kindle) is small enough to fit in your purse or back pocket, but powerful enough to save a soul. The Marian Brothers are praying that it becomes the standard booklet on how to pray the rosary found in parishes, schools, seminaries, prisons, and, well ... everywhere. This book contains all you need to know about the twenty-six men and women who have made the rosary a major part of their spiritual lives and championed it to the world. 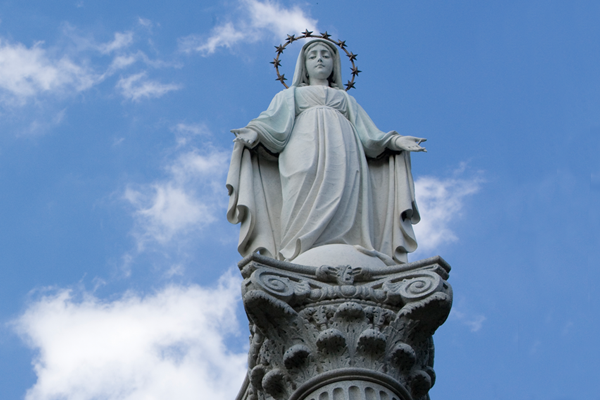 These champions encouraged others to glorify God, honor Mary, and save souls through the blessed beads of Our Lady. You will be very inspired by this book. Who knows, you could be the twenty-seventh champion! 3) "Queen of the Rosary" canvas image available in Color or Black and White. In this beautiful artistic depiction of Our Lady, the Queen of the Rosary is shown holding a rosary in one hand and a sword in the other. She stands on top of the ancient serpent, puncturing its head with the sword and offering the viewer the spiritual-sword of the rosary. This image is very unique and you will love it! All of the above items can be purchased on the following website: www.fathercalloway.com. On that same website, you will find many other products, as well as information on the many pilgrimages led by Father Donald Calloway, MIC. If you have never gone on a Catholic pilgrimage, pray about joining him on one! Please consider helping their seminarians by purchasing these items and letting your friends on Facebook and other social media outlets know about these new products on the rosary. Lastly, please check out the 4-minute video which Father Calloway recently did for the Knights of Columbus on the rosary. It's especially meant to help men pray the rosary. ﻿The article below was sent by Brother John Samaha with the following comment: "A Tribute to Teachers ..."
The Teacher's Calling by Brother John Samaha, S.M. Teachers can easily become discouraged in their efforts. They are a few attempting to accomplish much. If the twelve chosen by Jesus leavened the world, what about us? Hear St. John Chrysostom on this concern: "For a leaven converts the large quantity of meal into its own quality (Mt 13:33); even so shall you convert the world.... Let nobody reprove us, therefore, for being few. For great is the power of the Gospel and what is once leavened becomes leaven in return for the remainder.... Now, if twelve men leavened the whole world, imagine the extent of our weakness in that we cannot, in spite of our numbers, improve what is left. We ought to be enough for a thousand worlds and to become leaven for them. But they were the Apostles. So what? Were they not partakers, with you? Were they not raised in circumstances like yours? Did they not enjoy the same benefits? Did they not practice trades? Were they angels? Did they come down from heaven?" St. Basil the Great explained that the preachers and teachers who proclaim the Gospel are the lips and eyes of the Holy Spirit to enlighten and guide the hearts of the faithful. They are the enablers and coaches training the members of the team to serve Christ, "equipping the saints for the work of ministry, for building the body of Christ." (Eph 4:12) Priests and religious educators discover and form the spiritual talents of learners for evangelization, witness, and service to the needy for the building of the Mystical Body of Christ. The task of ministry is twofold: to gather and train the people of God for worship, instruction, and empowering; then to scatter them across the world as servants of the Lord. We not only go to church, we are the Church. Living the liturgy begins when we depart the church doors. Mindful of our calling to this ministry, and faithful to our missionary role to bring others to Christ, we forge ahead to attract others to join us in understanding and living our royal priesthood. In the Marianist perspective, teachers participate with the Blessed Virgin Mary in drawing others into the life of Christ. The program will include the presentation of the fifteenth Pro Ancilla Domini award and the inauguration of the new library at the Marianum. For more information, email marianum@marianum.it. Pope Francis explained that the feast of the Assumption of the Virgin Mary, celebrated on August 15, 2017, concerns in fact the "future" of the baptized, of humanity: she announces "Christ's victory" over evil. The Holy Father posted this message on his account @Pontifex: "Mary's Assumption regards our future: it turns our gaze heavenward announcing the new heaven and new earth with Christ's victory." Pope Francis had already published a "Marian" Tweet last Sunday, August 13. He stressed the virtue of humility. "Mary shows us that humility is not the virtue of the weak, but of the strong who do not mistreat others to feel themselves important." A California Catholic school is facing a backlash from parents after officials took down some religious statues--including one of Mary and baby Jesus--over concerns that they were "alienating" prospective students. The head of the San Domenico School in San Anselmo said parents of some prospective students who visited the campus--which was founded in 1850 and serves 671 students grades K-12--expressed concern about the religious figures, according to the Marin Independent Journal. "If you walk on the campus and the first thing you confront is three or four statues of St. Dominic or St. Francis, it could be alienating for that other religion, and we didn't want to further that feeling," Amy Skewes-Cox, who chairs the school's board of trustees...."
Find out what images of Mary might be the most popular ? depending on who you ask. Learn about the significance of the inkwell in some Marian art. Salus populi romani (Protectress of the Roman People) is also a selected topic this week. This week's resources are in celebration of the birth of the Blessed Virgin Mary.